Yesterday's Sun-Times, the self-proclaimed "Progressive, Independent Conscience of the City," ran an editorial delineating why, despite a judge ruling to the contrary, a proposed Planned Parenthood "health center" should be allowed to open. The following is but a few of the reasons thousands of thoughtful citizens disagree. First of all, far from being a "progressive, independent" view, the Sun-Times editorial started by trotting out the tired old Planned Parenthood dodges as to why this shadowy show must go on. 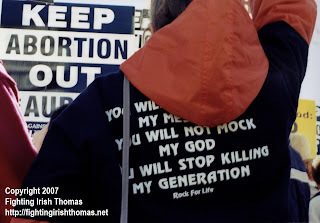 "Less than 10 percent of the total [Planned Parenthood] services are abortions," the article quotes PP spokeswoman Sara Knaub, and while I personally don't believe, even if her abortion figures are accurate, that 90 percent of the services Planned Parenthood provides are moral (for its gospel of contraception is in fact a deceptive if not dangerous contradiction to the Judeo-Christian teaching of marital love and responsibility), let us for the sake of argument agree that 90 percent of what Planned Parenthood does is at least not, as most scientists now see it, the killing of innocent life. If I were an exemplary husband and father 90 percent of the time, but the other 10 percent of the time I beat my wife and molested my kids, would not the editors of the Sun-Times (and perhaps even the folks at Planned Parenthood) be outraged? Next, the Sun-Times makes the point (as does Planned Parenthood) that if the building permit for Gemini Health Center wasn't a "transparent" cover for a PP to the Aurora City Council and its town's citizens, "it certainly should have been." While the annals of Chicago politics are full of such back room deals, and I would be naive to think Aurora Mayor Thomas Weisner and a few of his cronies didn't know what was going on, I am hard pressed to believe that the pro-life city council members, let alone the citizens of Aurora, knew (or were supposed to know) the truth of the matter up front. If they were, why didn't Planned Parenthood just ask for a permit in their name which would allow them the access to perform abortions in the first place? Finally and most amazingly to me, the Sun-Times editorial seems to not only unwittingly contradict its position, but lends fuel to the passionate pro-life fire. "Abortion is a sad, desperate act," the editorialist declares. "No woman wants to submit to it." I suppose the writer thinks he or she saves their position later saying, "but when weighing the circumstances, some see it as their best option," but think again. A sad, desperate act is our best option? Could this be America we are talking about? For a second I thought we were in WWII-era Germany or Russia (or the pre-Civil War South), where escaping, with a 90 percent chance of capture and death, or remaining captive, where the chance of torture and death were closer to 100 percent, were the only choices. Since when is America a place where a sad, desperate act is the best choice? Perhaps if the clinic were to open with options that weren't desperate, such as adoption or doctors and case workers who would encourage and guide you if you decided to keep your baby, there wouldn't be any desperate choices at all. To pro-lifers, those who promote some sad, desperate acts, will eventually (like Planned Parenthood's spiritual founder Margaret Sanger) promote them all. Simply turn your eye to China, where state mandated birth quotas (something Sanger often preached) are not only enforced via abortions, but also through infanticide if the offending child hasn't been detected in time. In China, they sell fetal soup (made from aborted babies) in the finest restaurants and though these eateries (like Planned Parenthood with abortion), no longer advertise the soup openly, it has become something of an expensive delicacy, a "selling point" to their clients of ways and means. Do you see a slippery slope? The pro-life people do, and that's why they want to "KEEP ABORTION OUT OF AURORA," and, eventually, Planned Parenthood out of America too. Were you quarterbacking a team in the two-minute drill to pull our team ahead in the game, Touchdown Jesus would be but a few yards from signalling a great score against a far too potent enemy. We are even forced to pay to permit this enemy to cheat against us. Too bad this two-minute drill only buys a first quarter - so much game yet to play. And, the stakes are an 'ultimate national championship'. At your own personal judgment, one thing you will have earned is your wreath for battle well fought. You fight it well, with God's graces. 'The quarterback who wins the big battle.' Have any eligibility left? Maybe you can help Coach Weis. Great post! Abortion is far more evil than we realize. The 1st evil is that is kills the most innocent humans. But it is also evil for what it does to us... who allow it, tolerate it, live with it. Even for those of us opposed to it for all these years, we are still forced to live in a society that deliberately murders its young and this demeans each of us. Sitting in their air conditioned luxury office at the Sun Times, writing about this issue like it was an abstraction dehumanizes me and you. That is why they hate the pictures of aborted babies so much. Those pics make our crime, our sin, bloody and brutal. This isn't a slick legal brief issue this is a dead baby thrown in a dumpster issue. "....girls and women in Aurora deserve access to a range of reproductive health services." I am ashamed that this is an issue in my country.